Still plenty of summertime left to fire up that grill and start cooking! 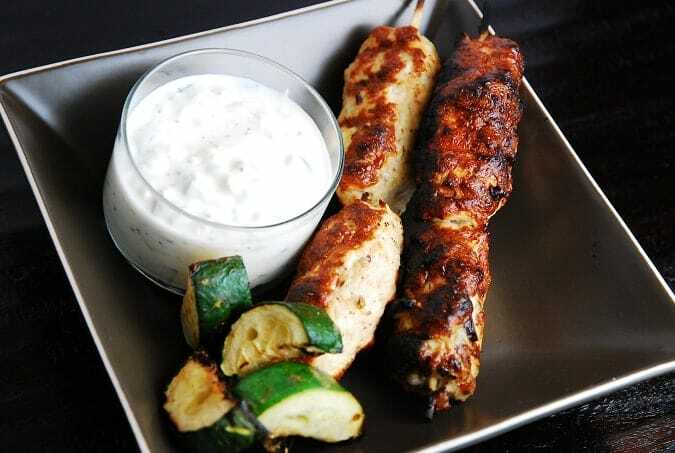 One of my favorite Weight Watchers Grilling Recipes is this Grilled Middle Eastern Turkey Kebabs with Cucumber Yogurt Dip. Having been to the Middle East a few times, kebabs are one of the most delicious foods I’ve had there. So I wanted to create my own lighter version, and the results are pretty fantastic. The ground turkey meat is incredibly flavorful, and the cucumber yogurt dip is the perfect complement. Truly a delicious and satisfying meal that will keep you on track with your Weight Watchers goals. So instead of burgers, hot dogs and grilled chicken, give these Grilled Middle Eastern Turkey Kebabs a try instead. Enjoy! A fantastic Mediterranean flavor transforms lean ground turkey into these incredible, low calorie turkey kebabs. Completed with a fresh and tangy cucumber yogurt dipping sauce, this is one Weight Watchers Grilling Recipe that is a wonderful alternative to traditional grilling fare. Place skewers onto grill. Don’t flip or move them until the bottom side is cooked; the meat will easily release from the grill when it’s ready. If you force it too soon, the kebab will break apart. OMG I LOVE YOU!!! This looks awesome! I can’t wait to try these – they sound great!